This rut damage was made by a truck delivering building materials to a house. It took seconds to make, but a repair of this size, involving rebuilding the verge and returfing, costs nearly £300 to repair. This is equivalent to the annual levy for two Chorltonville households. We need all residents to help ensure that this unnecessary drain on our budget does not occur. Over the last few years residents on the estate have seen huge increases in the value of their homes and unsurprisingly many people have commissioned alterations and extensions to their properties. 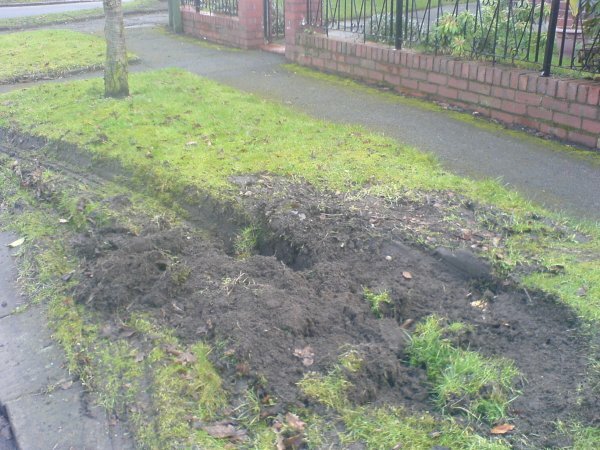 Unfortunately this means that there has been a corresponding increase in the number of contractors' vehicles and delivery vehicles visiting the estate resulting in significant damage to the verges. 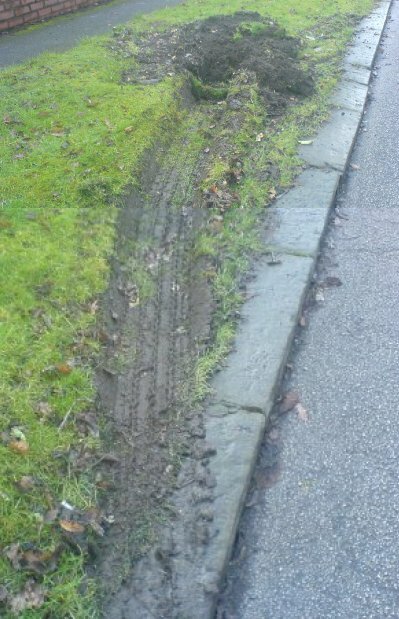 This occurs from vehicles driving over the verges, parking half-on/half-off the verges and leaving materials such as pallets of tiles and bricks on the verges. Requesting suppliers to use smaller vehicles when delivering goods so that HGVs do not have to use the roads. The larger the vehicle the more likelihood it will have to drive over the verge. Informing visitors and contractors not to park on the verge but rather to use your driveway or park fully on the road. Adopting sustainable parking habits yourself and not parking over the verges. Making full use of your driveways and parking off the road wherever possible. Discussing with neighbours whether it is possible to park on one side of the road to avoid traffic, and especially larger vehicles, having to weave or use the verge. Reporting details of tree and verge damage to the committee with details of vehicle, company, registration, date, time, place, property it was visiting and damage caused. Photos of the offending vehicles help also. If you are prepared to be a witness to the damage it will enable us to resolve disputed claims. Removing vehicles off the road the first Friday of the month in order that the Council can carry out a successful road sweep. The vehicle tends to start very early in the morning so cars should ideally be removed the night before. Where we have evidence that an individual or company has caused damage, we will make a claim from them for the cost of the repair. If necessary, this includes court action – in 2007 we successfully retrieved repair costs this way. Advising contractors not to leave any materials or skips on the verges. Placing refuse and recycling bins awaiting collection on hard standings rather than the grass verge. This also helps with the effectiveness of mowing exercises. Placing building materials and skips on verges damages the grass, compacts tree roots and can flatten the curve of the verge itself. Cars parked overhanging the verge can also in the long term deprive the grass of light, causing bald spots. In these cases, the Committee will initially send a letter to the relevant house owner, alerting them to their responsibilities and advising that they will be liable for any repair needed. If the owner takes no action as a result, then the Committee will repair any damage caused and reclaim the cost from the owner. All verge damage has to be rectified which costs money. This has to be funded from the levies unless we have evidence of how the damage occurred. Tracking down the perpetrators and receiving appropriate compensation is itself a time consuming exercise for the volunteer Committee members and not the best use of our limited resources. Please try to assist in protecting the verges, both in controlling the actions of visitors to your property and your own practices. Thanks for your help to keep costs down for us all!